SLCC team finished season 44-7 headed into national competition in home state. Lauryn Goaslind crosses home plate after hitting a home run against CSI on Friday at Salt Lake Community College's Norma Carr Field on its Taylorsville Redwood Campus. This group has come together, and we have high expectations. We have worked very hard for this opportunity. 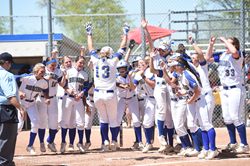 Salt Lake Community College’s softball team won the Region 18 Tournament for a chance to play in the NJCAA Division I Fast Pitch National Championships this week in St. George, Utah. Tournament action for 16 teams begins May 18 and continues through the championship game May 21 in this double elimination format. The SLCC Bruins battled CSI Friday in the region tournament at SLCC’s Norma Carr Field on its Taylorsville Redwood Campus and won 3-1 for a trip to nationals. The Bruins finished the season 44-7 overall and 21-1 at home. “We are very excited to participate in the National Tournament,” said Bruins Head Coach Cyndee Bennett. “This group has come together, and we have high expectations. We have worked very hard for this opportunity.” SLCC had four players earn Player of the Week honors: Tina Ford, Rae Gall, Kylie Everill and Addie Jensen. Gall went on to win NJCAA National Player of the Week. The team also had First Team All SWAC players in Rae Gall, Karly Bunderson, Ashlee Crabtree and Lauryn Goaslind.